Last week at this time, I was anxiously awaiting the return of my daughter from her survival weekend. Shortly after I posted Survival, I hope, the phone rang. “Where are you?” she replied, as if she’d never been gone. I hopped into my car and raced down to the high school to retrieve her. I got out to hug her, but I kept it brief; there’s no shower in a debris hut. Despite the fact that I was busting with curiosity, we agreed to wait until her father got home for the full debriefing. I did ask a couple of baseline questions like, are you alright and did you have fun, but I was content to wait for the details. It turned out, not much actually happened during the trip, but as we all know from Seinfeld, a show about nothing, it doesn’t take much to make a great story and my daughter is quite the raconteur. There was the bit about crawling into her sleeping bag with all her clothes on, including a pair of mittens, only to discover that she couldn’t use the zipper with mittens on, and she couldn’t get the mittens on once she was in the sleeping bag. Happily the sleeping bag was warm and mittens were not necessary. She told us how wonderful it was to fall asleep while looking up at the trees and the sky, only to realize when she opened her eyes that she hadn’t actually been asleep. Without a watch, it was impossible to tell what time it was or how long it took to do anything. With or without sleep, she loved her nights in the woods. She came home the self-proclaimed “queen of peeing-in-the-woods” and an expert snow mason (two unrelated, newly-acquired, skills). There was also a touch of pathos; the first full day was a bust when it came to building a fire. Her spirits were dampened, but she rallied and the next day she not only built and maintained her fire, but she was able to boil water and cook macaroni and cheese. Then she sat by the fire and ate while reading Walden. She brought home the leftover mac and cheese, in the pot, and told us that she intended to put it in the freezer and eat it again on the anniversary of her adventure, the way one might a slice of wedding cake. The only human contact the kids were allowed was with the support crew when they made their daily visits at daybreak and dusk. She chose to do her trip solo which meant that as long as she posted a note each morning and evening that said she was fine they wouldn’t intrude. 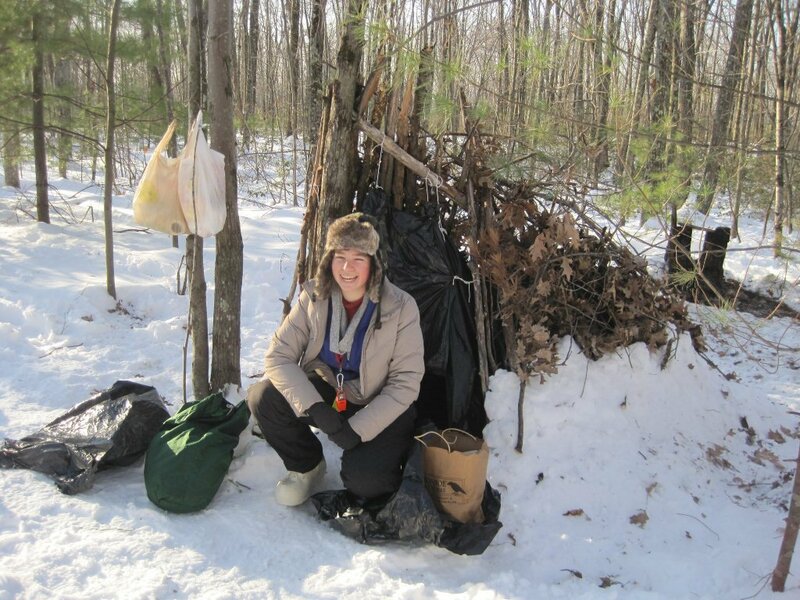 However, the outing took place in a state forest, open to the public in Townsend, MA, and every once in a while she saw someone walking through the woods who was not associated with the base camp. They would wave, or look at her quizzically, but fortunately no one stopped to ask what she was doing out there on her own. Even the man she thought she recognized who went by with a baby on his back, and later found out was, indeed, another gym teacher from the high school! So all in all, it was a wildly successful trip. I can’t begin to tell you how proud we are of her. The only tiny problem is that she might have come home a bit spoiled. When we said goodnight that first night home, she complained that her bed was too cold! This entry was posted in Uncategorized and tagged building a fire, Seinfeld, sleeping under the sky, state forest, survival trip. Bookmark the permalink. Way to go Hannah! And to her folks for having the courage to let her go. Be careful, you may have an outdoorswoman on your hands! Amazing…how many kids did took part? What a brave girl you have! How empowering! I think there were 29 kids. It was one of his biggest groups, if not the biggest. The teacher set up a secondary base camp so no one would be too far from help. Wow, she’s brave! Glad you braved it too. is this the survival through the high school gym? I thought I heard something about it at the 8th grade parent night. They had a similar program at my high school. Not my kind of thing! Yes, it’s a gym class (which gets you out of gym for the rest of the year). A lifetime memory. A positive experience. What more can one ask at age 19 or 49! Great article, Judy, as always. My son also survived but was very very cold at night, probably from having his head just slightly lower than his feet (live and learn!). He had a funny story about going to sleep “a while” after sunset, sleeping for “hours,” and then waking to hear a very distant churchbell chiming — six bells. It was only six o’clock at night! Your Hannah was very brave to do this, and to do the flag system. Very very cool! Oops..I was saying the inability to judge the passage of time was part of the shared experience.